The way we communicate at work has changed. New approaches and new tools are required to thrive in a digital world, where the best ideas can come from anywhere in your organization. When you’re ready to modernize and streamline your organization’s corporate communications, Blink is here to help. With Blink, multiple departments can work together smoothly, sharing their objectives and their vision to meet company-wide goals. Engage large numbers of employees in idea generation, problem solving, and innovation easily with Blink’s easy-to-use mobile interface. Top-down isn’t sufficient anymore. Make corporate communication a two-way street and reap the benefits of a more engaged workforce. What’s Your Corporate Communication Strategy? If you haven’t invested many resources in organizational communications, you’re not alone. A lot of companies ignore their internal communication needs until solvable issues snowball into catastrophic ones. Don’t let your company be one of them! Make implementing or updating your internal comms strategy with Blink a part of this year’s goals. It’s never too late to implement a new corporate communication strategy. Employees in the office and on the road can run their days on Blink, where they’ll find everything they need to succeed. Make sure your employees are aware of your employee-first policies. They can find and utilize their benefits right in Blink. Communicate directly with your employees or across teams in a space where authentic dialogue and constructive feedback is encouraged. Embed audio video, images, and articles into employee feeds to create a richer, more captivating picture of your organization’s culture and goals. Harness Blink’s powerful enterprise class tools in a social-inspired platform that’s easy to use and employee-friendly. The best ideas come from anywhere. Allow your teams to share best practice, news, success and more with colleagues globally. Organizations big and small with strong internal communications plans and platforms have more engaged and more productive employees — and that means lower employee turnover. Fewer mistakes are made, so less time is spent putting out fires. Shareholders can expect higher returns. All this adds up to the fact that putting a powerful company-wide organizational communications strategy in place can mean the difference between making money or losing money. Blink can become the cornerstone of your internal comms plan. People work harder when they have a clearly defined purpose. Goal setting is only the first step in helping your employees find theirs. 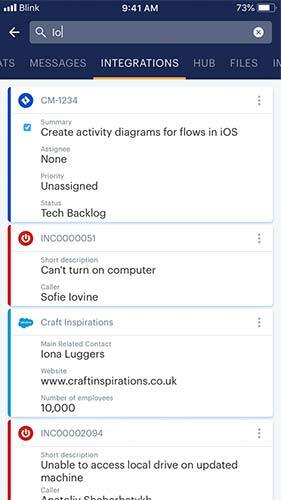 Blink lets you share information about recent staff achievements, whether they’ve met a goal or gone above and beyond in the pursuit of one. One of the most popular features of Blink is the feed where you can share content that models success and will inspire dedication, motivation, and innovation in your teams. Blink tracks key metrics, providing stats for every post on every feed so you can measure the reach and the impact of your organizational communication in real time. Blink empowers workers across your organization, including mid-level management, by making information readily available to all those who need it. Centralized communications free managers to set and meet team-wide goals and give workers a chance to operate more independently. Blink’s tools also make it easier to coordinate training at all levels so everyone in your company can grow in their roles.